Gmail Keyboard Shortcuts also called access keys, shortcut keys, key combinations) are the fastest way to perform specific actions in your Computer. A simple combination of keys help you save time by allowing you to never take your hands off the keyboard to use the mouse or the trackpad. For instance, simply pressing Ctrl+Enter (⌘ + Enter in Mac) can send a composed email. You can figure the difference and the ease of using the shortcut key to clicking the “send” button. There are some basic keyboard shortcuts that are automatically enabled in your inbox, and others that need to be enabled manually. And, to be able to use the shortcut keys, you’ll need a Standard 101/102-Key or a Natural PS/2 Keyboard. 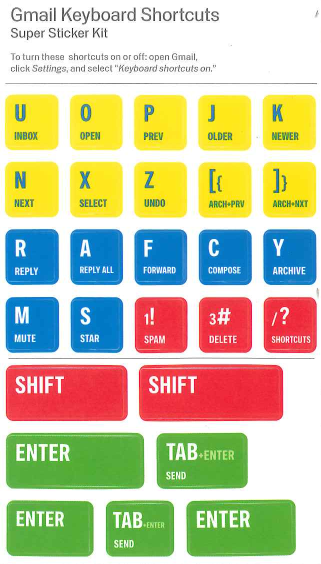 Here are the Gmail keyboard shortcuts, which are enabled by default. How to enable optional Gmail keyboard shortcuts? Go to Gmail sign in page (gmail.com) from your web browser, or click here. Use your Gmail account ID and Password to sign in to your Gmail account. Click the gear icon at the top-right corner of your Gmail page. Finally, click Save Changes to enable Gmail keyboard shortcuts. A complete list of shortcuts can be accessed by pressing Shift + ? in Gmail. The Gmail keyboard shortcuts appear as an Inbox overlay that you can dismiss by pressing Esc.